Our Cooling Tower services include cleaning, repairs to all makes or models and epoxy coating of corroded cooling towers. A thorough and efficient cleaning service for cool rooms, we have the experience to ensure the entire room and cooling unit are decontaminated effectively. Our coil cleaning service includes exclusive pressure washer equipment and chemical technology able to penetrate the inner core of coils. We are the experts in repairing, cleaning and maintaining all makes and models of cooling towers humicool and Thermfresh units. 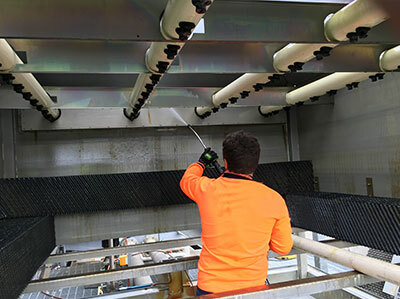 At Gloster Services we service Melbourne and the wider Victorian, NSW, SA and Tasmanian communities with clean and efficient cooling tower and cool room cleaning services, maintenance and repairs. We have many years of experience working with a wide range of companies from large corporate and retail companies trusted around the country to small businesses that service the local community.